The Mojave Foundation is pleased to present Mojave’s first Jazz/Blues concert on October 17th. Admission is FREE, and all proceeds go directly to make health & safety upgrades to the town, such as streetlights, community parks, and housing. But WE NEED HELP PROMOTING THIS EVENT. We need volunteers to help follow up with newspapers and radio stations, and reach out to media markets in the Antelope Valley, Bakersfield and Los Angeles. We also need help reaching out to potential donors, retailers, grocery stores, corporate partners – to coordinate door prizes and gift incentives for larger donations. Contact Marlena Balvin at The Mojave Foundation to help, at Marlena@MojaveFoundation.org or 661-749-0940. 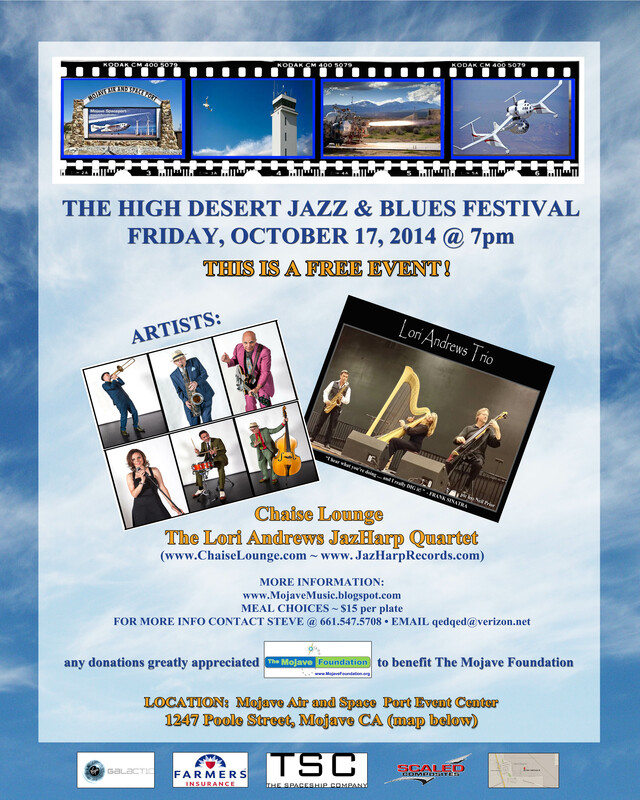 The Mojave Foundation is bringing two world-class performing artists to the Stuart Witt Center at the Mojave Air & Space Port in Mojave, the Chaise Lounge Sextet, and the Lori Andrews Jazz Harp Quartet. Doors open at 7pm, and guests are encouraged to bring a chair. Walk-ins are welcome, but guests are encouraged to RSVP – especially if they want a meal, which will be available for $15/plate. RSVP with Steve at 661-547-5708 or qedqed@verizon.net. This entry was posted in Community events, Jazz concert, Mojave CA and tagged Chaise Lounge, Lori Andrews on October 6, 2014 by mojavefoundation.